We continue our exploration of the jewelry box of our Magpie of the Month, Grand Duchess of Maria Teresa of Luxembourg, with a look at the family's magnificent set of diamond rose brooches. 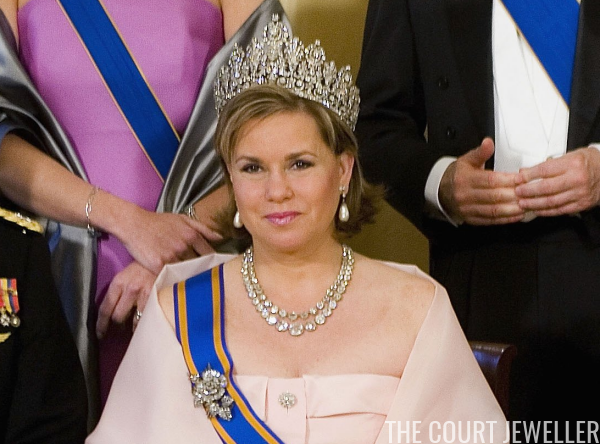 Maria Teresa often secures the sash of her order with a lovely, naturalistic diamond brooch made to resemble a rose. But according to our friends at Luxarazzi, the family doesn't just have one of these brooches: they have at least three! The family has had them in their collection since at least 1859, when they appear in one of the Nassau jewel inventories, so their creation pre-dates that moment in history. The brooches are all similar in design, but they have very slight differences, including the placement of the diamond leaves and the precise shape of the rose. Many members of the family have worn the brooches, usually one at a time. 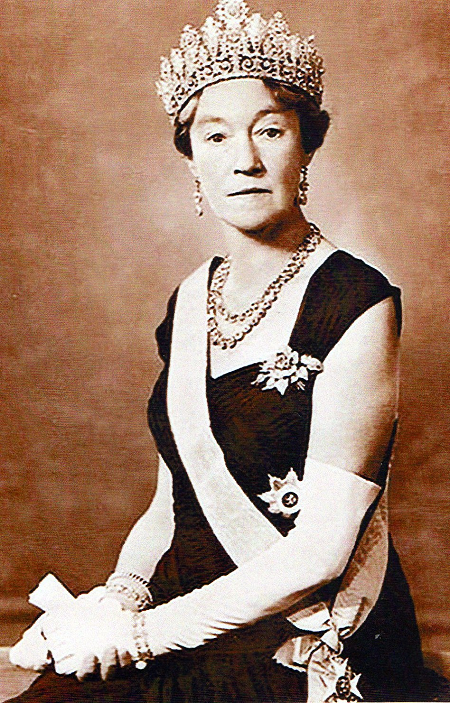 Above, Grand Duchess Charlotte wears the brooch in a bejeweled portrait taken late in her reign. Grand Duchess Josephine-Charlotte also took at least one of the roses out for a spin. Like Charlotte, Grand Duchess Maria Teresa has also paired one of the roses with the family's grandest diadem, the imposing Empire Tiara. Here she wears the jewels together at a state banquet in The Hague during the state visit to the Netherlands in April 2005. This view gives you an idea of the size of the large rose brooch, as well as the detail in its design. Look at those leaves! 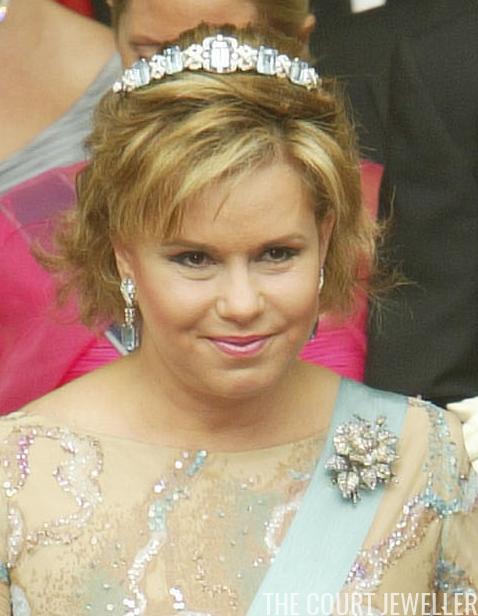 Maria Teresa has also worn the brooch with some of the family's more modern jewels. For the glittering royal wedding of Crown Prince Frederik and Crown Princess Mary of Denmark in Copenhagen in May 2004, she paired one of the roses with the mid-century diamond and aquamarine suite made for her mother-in-law, Grand Duchess Josephine-Charlotte. Tantalizingly, the ladies at Luxarazzi reveal that the brooches are part of a larger set of jewels, noting that the 1859 inventory notes that "parts of them either come from a devant de corsage, a large stomacher, or a tiara." The tiara is one of the mysteries of the Nassau family jewel vaults. Does it still exist? If so, is it in Luxembourg? Ah, to have unfettered access to this family's treasure trove of jewels!